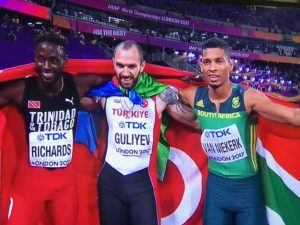 A mere 0.02 seconds separated Silver from Gold and a the smallest of measurable differences, 0.001 seconds split van Neikerk from Trinidad and Tobago’s Jareem Richard with the Bronze, as both athletes were given times of 20.11. 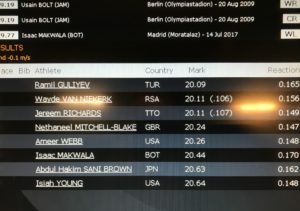 There was little question that the heavy schedule of 6 races in 6 days had taken its toll on both the South African and an emotionally charged Isaac Makwala, who faded to sixth in 20.44. Given the previous three days of unusual circumstances that were outside the control of either athlete, it was no surprise that both athletes were openly emotional at the finish of the event. 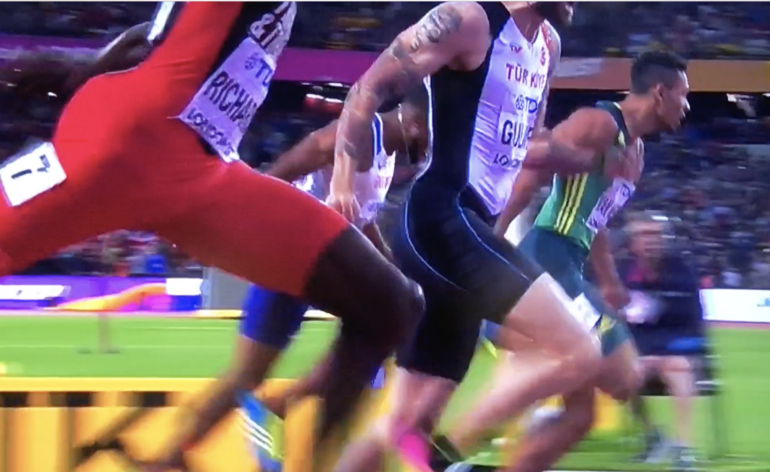 Makwala required to take a minute when interviewed in the mixed zone, while van Neikerk, who was the flavor of the month and endured over an hour in the international broadcast area, expressed his emotions during the BBC TV interview. Van Neikerk’s reaction times have dropped over the last couple of days, which debatably can indicate the level of fatigue in the central nervous system. To some extent the magnitude of van Neikerk’s scintillating Silver in the 200m, won on the back of a 400m Gold appeared lost on those who expected a golden double. It is incorrect to downplay the achievement of these six days of performance, by the South African. 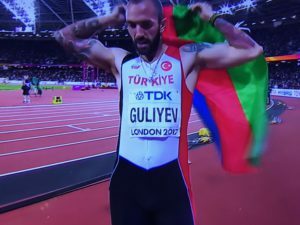 However, the ‘lost men’ amongst all of this, were Gold Medalist Ramil Guliyev, an Azerbaijani-born naturalized Turkish, and Jareem Richards, both of whom were to be commended for their tolerance and humility with their performances being rather overshadowed and understated. Ironically the distraction of the norovirus continued with the Public Health England sending out an update to say the number of people reporting illness had increased to 40, and the confirmed norovirus cases increased to 3. Now with five medals, many amongst the South African camp, commenced their discussion about the class of 2017 being the best ever, beating the previous best at World Championships in Paris 2003. The team currently hold second position behind USA and Kenya, (keep in mind Russia is missing), and have five medals compared to the four in 2003. Firstly, the number of athletes involved which could see South Africa with 6 medals by Saturday night but from only 4 athletes. Secondly the points table which calculates the placings on the number of finalists, where currently only Akani Simbine’s fifth place gains any recognition. By comparison in 2003, South Africa had one sixth, two seventh and two eighth placed finalists, showing greater depth and potential sustainability for the sport. This does not take away from any of the individual athlete performances, but should be a point of major concern for the administration and policy makers at national level, many, if not most are in London to observe. It is to be hoped that they can see what is happening and the urgent need to change the future. With 21 Gold Silver and Bronze medals still to be allocated, and South Africa with limited remaining opportunities, an even greater analysis is required, and will unfold, at the end of the competition. Nagoya Goule of Jamaica lead through half way in 60.51. Semenya looked comfortable with her recovery from the 1500m earlier in the week where she won bronze. Qualification was to be more complex for Gina Lofstrand, who had the second slowest personal best of her heat, and required either a top three or to be one of the six fastest losers to make the next round. Going in the final heat she and coach, Victor Vaz of Durban’s Fast Feet club, knew a fast race was her best chance and set the pacing for that outcome. Lofstrand did not disappoint taking the field through 200m in 28 seconds, and 400m in 58.71 before surrendering to the more experienced athletes down the back straight. The 21 year old was boxed in third place at 600m, disrupting her rhythm around the bend. Although still in contact entering the home straight, the KZN athlete faded to seventh as Francine Niyonsaba from Burundi took the honours in 1:59.86. It was the fastest heat of the night which gave Lofstrand 2:01.73 sufficient to qualify as 5th of the fastest losers for the semi finals. Justine Palframan, was knocked out in the first of three 200m semifinals, running 23.21 for 7th place behind Dafne Schippers, who is one of the favorites for gold. Schippers clocked 22.49 providing the fastest qualifying time of the night. 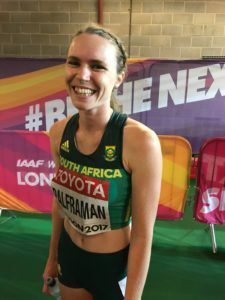 Palframan, will now change focus to Saturday’s heats of the 4 x 400 relay. The South African squad received a last-minute invite by the IAAF to fill the lane allocation. This means the squad will only now have the opportunity to focus on their baton changes and rhythm. The lack of focus on relay, and a specialized year round squad does not bode well, despite the individual athlete talents. Rocco van Rooyen failed to get anywhere near his PB of 85.39 in the javelin qualification. His best trial of 74.02, on the second round left him at the bottom of the qualification rounds. The only South African in action on Friday is Caster Semenya in the 800m Semi Finals at 20:35 RSA time.